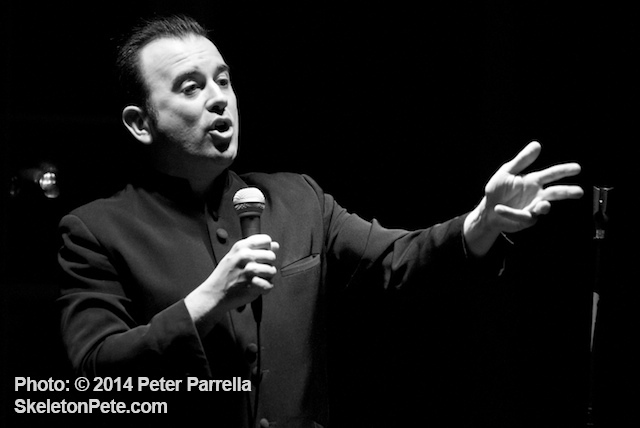 Steve Cuiffo Channels Lenny Bruce on Opening Night of Greenwich House’s Café au Go Go Revisited Series. February 1964 was a watershed moment for music. On the 9th day of that month The Beatles’ Ed Sullivan Show appearance hit American youth like a ton of bricks and triggered cultural and musical change that would evolve for decades; might still be evolving. A more quiet but ultimately no less influential debut happened just two days before, with the opening of the Café au Go Go in New York City’s Greenwich Village. I say no less influential because, while The Beatles may have been the “last straw” required to activate the wide scale cultural breach, “The Village” had a long established community with a fertile sack of social ideologies ripe for sowing by the teenaged baby boomer generation. Today the mention of early 60’s clubs may elicit the cliché of guitar carrying “folkies” strumming protest songs but the reality is that club owners Howard and Elly Solomon booked a bogglingly broad range of acts. Blues, jazz, bossa nova, comedy, the experimental films of video artist Nam June Paik and Andy Warhol, were all part of the experience at the 400 seat basement space on Bleeker Street. Check Bruno Cheriotti’s complete performance listing for a detailed eye opener. Although the club closed after seven years of business, in a sense its work had been done. A sensible lineage and evolution had been achieved. For instance, the Solomons had opened their doors to seminal blues artists like Son House, Bukka White, Howlin’ Wolf and Muddy Waters. In turn they were rightfully recognized as stylistic godfathers by newly minted blues journeymen like Paul Butterfield, Michael Bloomfield, Canned Heat and The Blues Project. Only two years later Howard and Elly would book genre busting bands like the Grateful Dead and Jefferson Airplane, and present the freeform psychedelic blues jazz of Cream (sporting full Marshall stacks) for two weeks. Jimi Hendrix played the club, both before and after his career launching trip to England with Chas Chandler. (L to R) David Amram, Matt Umanov, Terri Thal and Ashley Kahn discuss Greenwich Village in the 1960’s. To commemorate the 50th anniversary of the venue’s opening the Greenwich House Music School is presenting a two month long tribute to the club. Looking over the upcoming schedule of Thursday night shows, which will continue through April 24, it is clear that curator Jenny Wasserman has compiled a series that emulates the breadth of Café au Go Go’s eclecticism. The opening night event, called Scenes From a Café, was comprised of two sections, a panel discussion peppered with excerpts from Seven Years Underground: A 60’s Tale, – Jason Solomon’s 2012 documentary about his parents – and a performance by Steve Cuiffo as Lenny Bruce. Greenwich House Director Rachel Black welcomed the attendees and introduced panel moderator Ashley Kahn, a music journalist and author of books on the work of John Coltrane and Miles Davis. 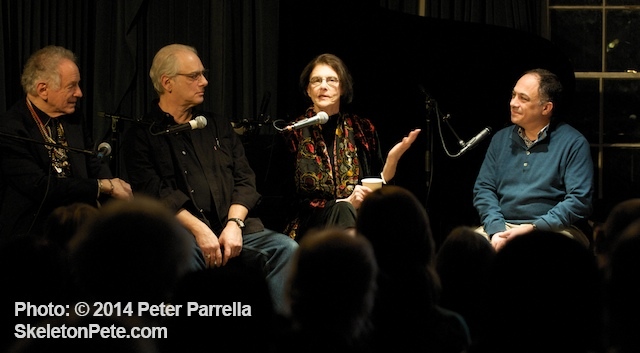 Kahn brought to the stage David Amram, Matt Umanov and Terri Thal for a spirited and fascinating discourse on the Café au Go Go and 1950’s – 1960’s New York City music scene in general. Any single facet of multi-instrumentalist, composer/arranger/conductor David Amram’s musical résumé could be considered a life achievement, and it was a pleasure to hear the self titled “senior-bopper” share his stories. At 83 he still regularly performs “basket shows” at The Cornelia Street Cafe to keep in touch with his Greenwich Village roots. The 2011 documentary “David Amram: The First 80 Years” is an excellent overview of his life and work so far. Luthier Matt Umanov, whose music store is a Bleecker Street fixture for 45 years, stressed the continued community bond. Although he did not open his shop until after the Café closed, his clientele as a local repairman was comprised of many of the club’s regular performers. He was happy to convey that his establishment continues to be as much a “hang out” as a retail and repair shop, with patrons like John Hammond Jr. still stopping by the shop. 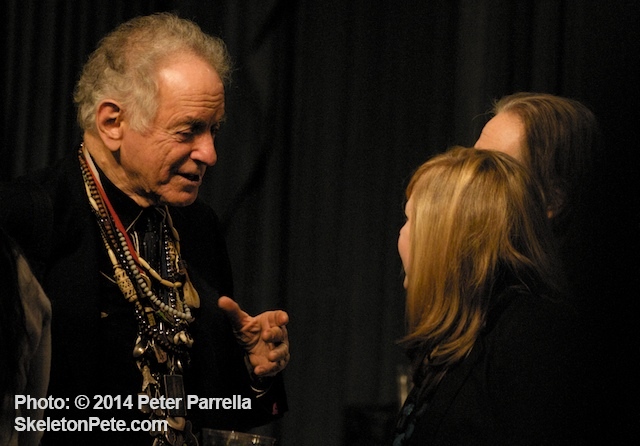 David Amram Chats with Series Curater Jenny Wasserman During Opening Night Intermission. Coinciding with this half century marker is the release of Joel and Ethan Coen’s Inside Llewyn Davis, a film which is in part inspired by The Mayor of McDougal Street, the autobiography of singer songwriter Dave Van Ronk. Panelist Terri Thal, was Van Ronk’s manager and wife during this time period affording her an insider’s perspective on the Coen’s spin. Thal was dismayed by the film’s “unpleasant” and overly competitive portrayal of the scene, which she said did not represent the real sense of community in the village at the time. While recognizing that the film is not a bio-pic and artists were competing to be heard, all panelists agreed that there was an overall “spirit of generosity” lost in translation to screenplay and screen. Whatever amount of creative license the Coen Brothers allowed themselves in the creation of their film, one thing is certain, Inside Lewyn Davis has sparked a resurgence of interest in the music of and people involved in the Greenwich Village scene of the early 1960’s. Amram was most pleased to see that younger artists following their creative path have come to the realization that you’re not selling out if you aren’t starving or dieing in the street. To paraphrase him, “What you do to pay the rent has no bearing on your art. What you deserve has no bearing on what you get,” but striving for “creating excellence,” even in situations where “it’s not expected” is the goal. The evening was capped with Steve Cuiffo’s brilliant reenactment of Lenny Bruce. It made me realize that, while music was the ignition key, it was iconoclastic comedians like Bruce, George Carlin, Irwin Corey and Mort Sahl who fueled change with an uncanny ability to expose the absurdity of then current societal mores. They took the hit for it, as did the Solomons for presenting them with a platform. Transcripts of the obscenity trails read like Joan of Arc’s inquisition, and Bruce often used the legal dogma to great effect in his post-arrest monologues, like the one Cuiffo presented. Seven Years Underground: A 60’s Tale is available on DVD at the Official Café au Go Go website store. Artist information and tickets to all upcoming Concerts are $20 or less – Available Now Online by Clicking Here. Please visit the Greenwich House website for information on their mission and program offerings.